So is it stuck in your head yet? Sorry about that ... really, I am. Here is the naughty quilt that broke the new sewing machine. I was sewing the sails on when it broke. Happily, now that it's fixed it's working perfectly. Yippee! 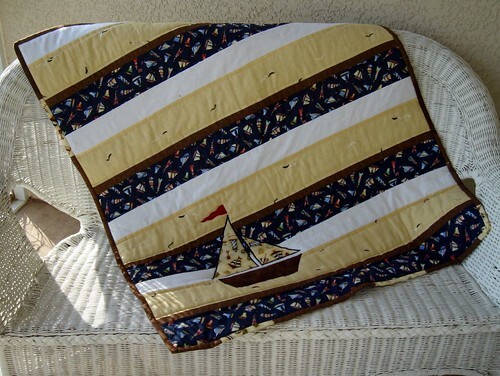 This quilt is nice and simple. 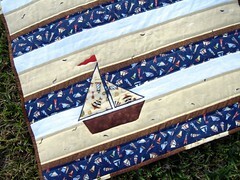 First, a blue sailboat fabric that I bought to make this bib. Then I used a pretty linen-like yellow with embroidered gulls on it. One edge of the fabric created this bib and what I was left with was the birds. At first I wasn't sure what I'd do with it but not I love it, and it was perfect for this quilt. The white is flannel, a recurring theme in my sewing lately, but irresistable (and since I overbought when I made the girls' quilts I've got plenty to work with). And the last is a brown leafy fabric. The boat hull is brown flannel, the sails are a cool beachy fabric I picked up just for this, and the red wind indicator is red wool felt. 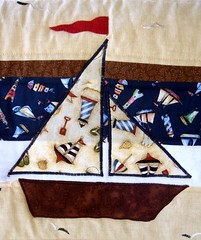 I had a really hard time appliqueing the sails. 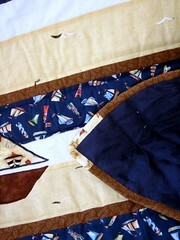 I made the mistake of doing the stitching after creating the quilt sandwich so it was a lot of layers to go through. Once the machine was fixed it went pretty smoothly, but there was a time when I was sure this quilt was going in the trash can. 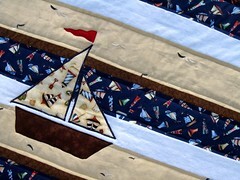 The binding is a combination of three different fabrics ... two browns and the sail fabric. This is the binding we accidently put into the strip quilt the started a few weeks ago, so I had to add something to compensate to make up with that. The backside is a heavier blue leafy fabric. On a completely unrelated note ... I have some questions/requests. *First, if you use coupons how do you stay organized enough to actually use them? *Second, I'm looking for storage containers that I can use if I make a casserole and want to freeze it and then cook it in the oven. But I'd also like the containers to stack when not in use ... I don't know who has the space for nine gazillion storage containers that don't stack! *Third, I'd love to hear some recipe or menu ideas, or links to places I might find some recipes, for low-cost meals that appeal to kids, though we don't eat meat. K. has been working very hard at not scribbling. We had a long talk about it last week, and since then he's been doing a great deal of coloring and no scribbling. 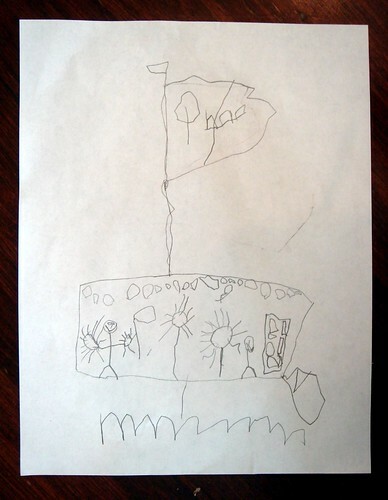 Today's picture is a sailboat, created as a Valentine's gift for someone (we can't convince K. that Valentine's in not on par with Christmas as far as holidays go ... you're welcome to try, but we've gotten nowhere). And yes, the Styx song is quite fixed in my head now. LOL! K's picture is amazing! I love when they tell you the story behind each little thing. I have one daughter who will fill the whole page with detail. As far as the casseroles go, line the pan with heavy duty foil, make the casserole, and then freeze the whole thing. When it's solid, just lift the foil out, wrap it well, and stick it back in the freezer. When you are ready to cook it, take it out, put it in the dish, and bake it! You can fill your freezer with lots of casserole "bricks" this way, and not use ANY containers! THank you Jenni! Yeah, that couldn't be much easier could it? I'll be trying it tomorrow. Hi. I think you have achieved the perfect blend of colours on your little quilt. It looks really lovely. Inspiring. Sorry I can't help with any of your questions but Jenni's suggestion about the foil sounds brilliant. I wonder whether it would work with soup too. Worth trying!